Become a Leader in Training (LIT) and learn valuable skills while assisting Recreation staff in our summer day camp. 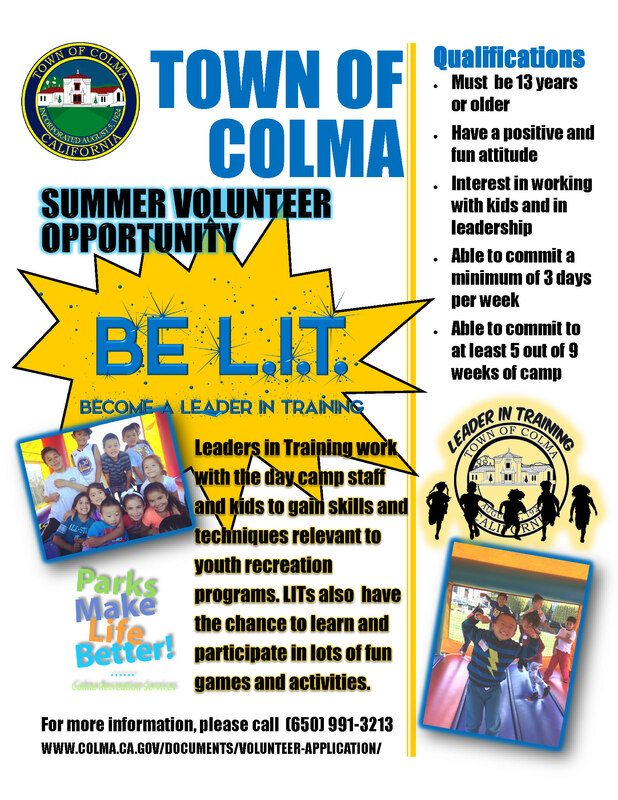 Teens who are interested in volunteering for the summer day camp should contact Dinora Navarro at 650-991-3213 or dinora.navarro@colma.ca.gov for more information. Applications are available online and are due by May 1, 2019. LIT’s are required to commit to working at least 3 days per week (10am-4pm) and 5 out of 9 weeks of summer day camp. Applicants will be interviewed and offered volunteer opportunities as needed. Interviews are tentatively set for May 13, 2019. A mandatory LIT orientation is tentatively scheduled for May 25th, 2019. New LIT’s must attend orientation in order to begin volunteer assignments.